Everywhereist.com – Is one of the regular travel blogs I read because it’s funny and yet informative. The author Geraldine DeRuiter (or the Everywhereist) has a quirky sense of humour and constant yearning for cupcakes. This lady also loves to bake, but the blog is officially a travel blog. You see she her husband Rand Fishkin travels an awful lot and Geraldine was tired of sitting at home, so now travels the world with her hubby and writes these blog posts while he is public speaking. The Everywhereist also has a decent eye for photography and has documented her travels with a lot (I mean a lot) of Hubby and Wife selfies along the journey. This isn’t a Lonely Planet tourist guide, but a real persons perspective on the things you can experience when travelling the world. Once you get to know her, your fall in love with her honest style, humour and may even find it hard to keep up with her busy schedule. There is so much more to her personal story but I’ll let you enjoy discovering that for yourself. 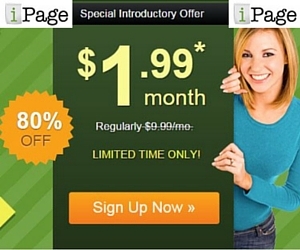 How they Make Money: – This site is newly monetized but there is an upcoming book and travel guides to leverage. 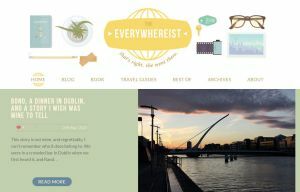 adventurouskate.com – Following the standard theme for travel blogs is Adventurous Kate. Choosing to leave the wheel and deciding to travel the world, what could be better to live one’s life. Kate brings a solo female perspective whilst travelling and appears to have mastered the dream of a work life balance. 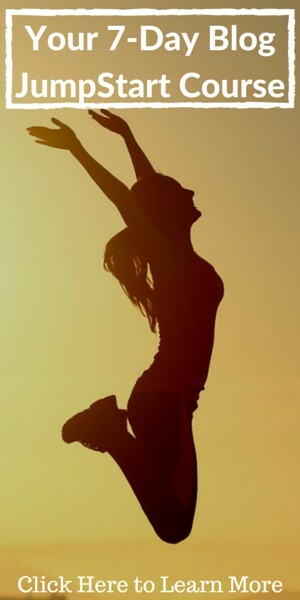 The secret to work life balance seems to be more life and a minimal amount of work. Kate’s adventure helps single women to understand that solo travel is really possible and despite the bad things you hear in the news is can be loads of fun. The good thing about travel is you rarely pay attention to the news anyway. 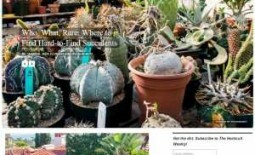 How they Make Money: – This site could be be better monetized as just using traditional affiliate ads and Google Adsense. However, on the flip side Kate does public Speaking and Freelance Writing. nomadicmatt.com – Matt Kepnes (aka Nomadic Matt) caught the travel bug from an early age and quickly learnt that by monetizing his travel blog could enable him to travel when he wanted without the restrictions of work. He has some great tips for travelling on a budget and his large reader base is an indication of how well he writes. But I guess if you have all that free time then you can focus on more meaningful work, whilst having fun at the same time. 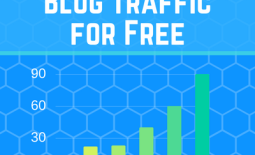 This site is well structured and has a great sales funnel and combined with the traffic flow, I bet it’s making a fistful of money. Good work Matt! How they Make Money: – This guy is smashing monetizing his travel blog. He has books, guides and programs to sell. 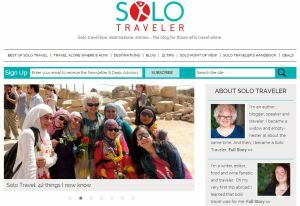 solotravelerblog.com – These ladies are great and show that travelling isn’t just for the young kids but is also rewarding for the young at heart. It might not be backpacking on a budget but the ladies do have a good time and enthusiasm is a plenty. In more recent times they have allowed a number of guest bloggers, but these are quality blog posts and are very related to travel and this doesn’t detract from the experience. There is a wide range of countries covered in this blog and all posts are well written and very well supported with photos, but we expect that because after all who doesn’t travel with out some sort of camera these days. twenty-somethingtravel.com – We can’t always be twenty something for ever, but “make hay while the sun shines” can never be truer for the travel blogger. Stephanie Yoder started traveling and writing and then fell in love along the way, but after recently finding a more permanent destination she and her husband are settling down and travel will less frequent. Having amassed a large readership the site keeps ticking over with Guest Bloggers. There are plenty of great tips and food reviews on this site, worth a look. 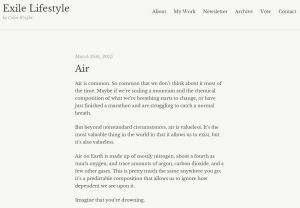 exilelifestyle.com – This blog first caught my attention because the author Colin Wright is showing how minimalism and travelling have certain synergies. He travels only with the barest of essentials and cherishes everything that is in his backpack. Unlike others who store there worldly possessions whilst they are travelling, Colin has nothing else besides what’s in his backpack and this freedom has enabled a limitless journey. If there’s nothing to come back to then he can continue to more forward even if he does travel to the same destination more than once. Traditionally, his readers decide which country he will pack up and move to. It’s literally a popularity vote every 4 or so months. Quality writing. 48houradventure.com – As the name suggests, this travel blog is all about the quick wins and travelling as a distraction from work rather than a lifestyle choice. 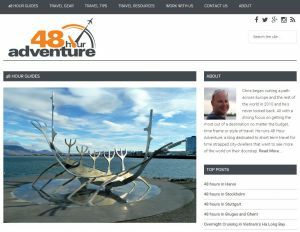 Given the limited time of a 48 Hour Traveller, this travel blog aims to take you to all the best places and direct you to the best food and attractions. Their handy 48 hour travel guides are essentially long blog posts packed with all the things you can do in the allotted time, including location maps and great pictures to prove that they actually went there too. This travel blog is also packed with the usual travel tips and resources, such as airport reviews and some great offers. Worth looking for a guide to somewhere you’d like to take that next quick break. 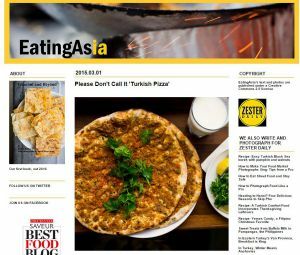 eatingasia.typepad.com – So many travel bloggers head to Asia, because it’s rich in culture and super cheap to get around and live for extended times. But, few write extensively about the food that is available, the food to try and the food to avoid. Whether it’s cheap eats or small cafes or restaurant quality food, this blog seems to cover it all. Having won an award for the best food blog I was wary putting it in this travel blog list, but when you read the posts you’ll understand why. Food is certainly the destination but travel is the journey. 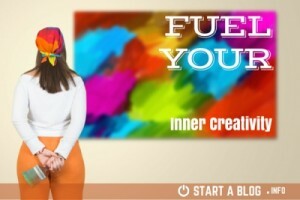 This blog is best read on a full stomach because you’ll certainly be salivating after reading just a few posts. The food photos complements the writing nicely and if you ever wanted to travel to Asia and was unsure about your food choices then start here and learn from the experts. 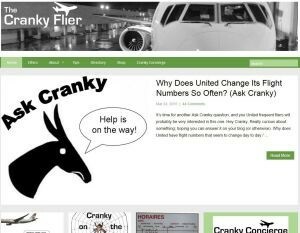 crankyflier.com – We’ve all been there, on a long haul flight, and after the 6 hour mark the excitement starts to fade and the insanity of being locked in what is essentially a small room that you can’t leave becomes all too real. As the anxiety kicks in you find yourself getting irritable and cranky. Is there a travel blog in that? Yes, Brett Snyder of The Cranky Flier thinks so. But, its not a blog about a cranky flyer but more so a blog that helps you to be less cranky on that flight, by keeping you updated with the latest in airplane travel. What’s hot and what’s not. If you are an airplane enthusiast like Brett then I think you have found your travel blog destination. Buckle up. Plus as a side business Brett has developed the Cranky Concierge service which is kind of a replacement for the old fashioned travel agent who use to do this type of work before everyone started to go self-service. Obviously there is still room for this type of full service travel. 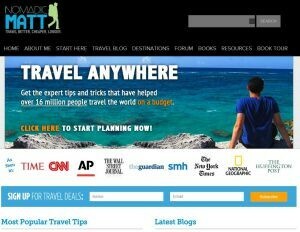 justluxe.com – This popular travel blog is as upmarket as it gets. I’m not sure if it’s a form of travel brochure or actually written from real persons perspectives. There is certainly lots of sponsored posts, and the site is surely monetised, but quality is expensive to curate. Regardless sometimes we don’t need too many options, but just some of the best ones, and this is where Just Luxe exceeds. 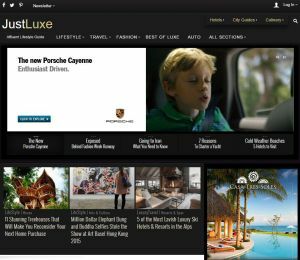 It’s not just a travel blog, Just Luxe also covers lifestyle, fashion and a smidgen of auto over indulgence. If you are looking to travel on the cheap then as they say ‘if you have to ask, then you can’t afford it’, so maybe give this one a miss. But for those with plenty of money and looking for a richer experience, then look no further than Just Luxe. 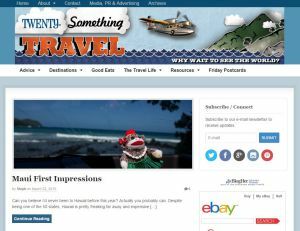 How they Make Money: – This is a professional travel blog so it’s fair to expect there is plenty going on, including run of site ads and just about every post looks like it was born via a sponsor. In summary these travel blogs are a good cross section of what has been popular in the past and continue to drive traffic into the future. This doesn’t mean your travel blog won’t reach the highs that you are expecting, it just takes time and consistent blogging. One thing for sure all travel bloggers try to reach a happy medium between travel and making enough money to support that lifestyle. Remember Travel Blog’s don’t just need to be about personal travel experiences, they can be about helping people to travel, or the deep thinking that you can tap into when you have free time. People travel for different reasons, but if you can tap into the money stream and make money blogging while you travel then this enables more travel which certainly helps pay for that next trip. If you want help to create a travel blog of your own, then head over to our Start Here page and find the help you are looking for. 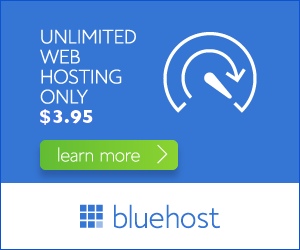 Share the post "10 Best Travel Blog Sites worth reading and how they Make Money Blogging"